Sometimes if you judge a book by its cover, and its subtitle, you can miss some exciting nuances. The subtitle for bring it! 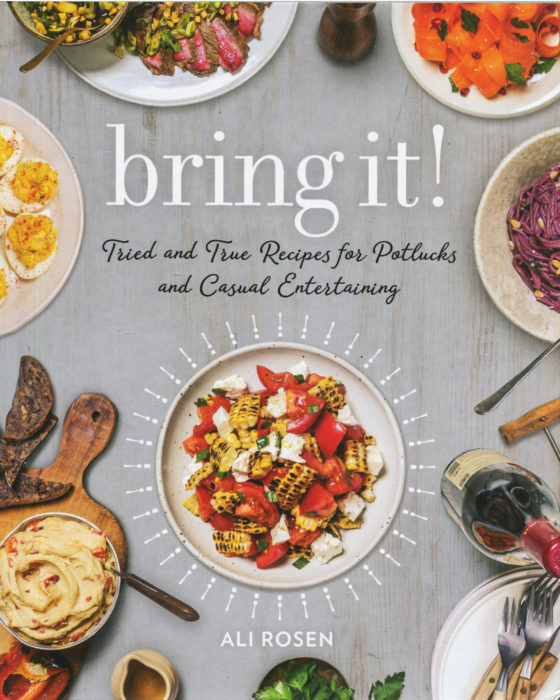 Is: Tried and True Recipes for Potlucks and Casual Entertaining. Ali Rosen has written this book so you have something just right to take to those gatherings where everyone supplies an element of the meal. With that assumption, you will find many “tried and true” recipes here so at first this book may all seem like familiar ground. If you already own a number of cookbooks, you might think that there is nothing new here for you to consider. That’s why you need a careful look at recipe titles, headnotes, and ingredients. Ali went to school in Scotland and has a recipe here for Shepard’s Pie from her roommate’s mother. If you have eaten this dish in Manhattan restaurants, you know it is something to be feared. It usually disappointing. But, comparing Ali’s recipe with several on the web and in other cookbooks, and you find a rich surprise. No ground beef. It’s Scottish so we have lamb. The usual peas and carrots must appear, but so does onion and carrot and garlic and Worcestershire sauce. A totally different dish, and a substantial one. Many of Ali’s recipes are literally stark. 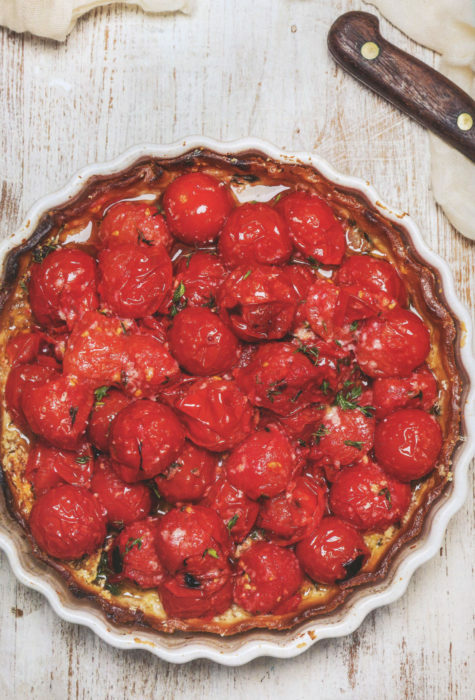 The Cherry Tomato Tart is just a combo of butter, onion, garlic, Parmesan, thyme and cherry tomatoes plus that crust. Can you make something here that is going to give you party pleasure? Yes. The Parmesan replaces the usual goat cheese so you have a quite different flavor profile. As this picture shows, Ali suggests an abundance of tomatoes so that the visual appeal of this dish is immediate. In short, Ali knows that simple can taste every bit as grand as complicated. And that enjoyment begins at first sight. Yes, these are dishes meant to be packed in a crate, driven to outside picnic tables, and shared with friends and family. But, you don’t have to share if you don’t want to. That Hash Brown Casserole would seem destined for many Sunday morning breakfasts. Just you, your spouse, the kids, and coffee. And on these winter nights, when the chill simply won’t leave you and you are considering leaving your coat on for an hour or so, well, maybe that is the time to pull the Shepard’s Pie from the oven. Each dish comes with “How To Bring It” suggestions so that, if you are in a sharing mood, your creation can arrive whole and handsome. bring it! will arrive in bookstores on March 13, just a month away. You can preorder now. And, you might want to stock up on ground lamb. Hi, I find the recipes here by going through each cookbook, page by page. The ones that have the highest appeal to me are posted here.